In January 2012 the Jazz Education Network (JEN), whose Board of Directors I am proud to sit on, launched the JEN Mentor Program. Over the last several decades training and education of aspiring jazz musicians has largely taken place in the “academy” – high schools, colleges & universities, and conservatories. This of course marks a departure from the traditional way so many of our great masters learned this music – in the figurative “streets”, through rigorous trial & error, and conspicuously through the mentoring of older, experienced musicians. This kind of mentoring would take place on the bandstand, and also on tour buses and other by comparison informal settings. This informal, grassroots mentoring was part of the oral tradition of jazz and far exceeded matters of pedagogy. So many of our master musicians and our great ancestors were mentored by their peers and elders back in the day on many levels, including all aspects of being a true professional musician. Opportunities for aspiring, student jazz artists to learn from their elders in the music have decreased under the current system. As a result we’re witnessing generational disconnects, along with the passing of earlier generations of jazz musicians who witnessed the formative years of the art form. So we’re lacking opportunities for elder jazz musicians to impart their learned wisdom on today and tomorrow’s aspiring jazz artists. Many master level jazz artists lament the passing of their peers and the scarce opportunities for young, developing musicians to learn what it means to be a professional musician from those “who were there”; the griots of the music are passing on to ancestry and unless they are engaged at teaching institutions they do not have formal opportunities to pass along their wisdom. Many of our student jazz musicians are receiving a first-class education in the music, however either through geographic challenges or other factors, their opportunities to interact substantively with “the progenitors of the music” are rare and far between – if they exist at all. It is out of this that the JEN Mentor Program is being developed. The mission of the JEN Mentor program is to provide one-to-one mentoring between college, university and conservatory student musicians and experienced musicians and music industry professionals. For college, university and conservatory jazz students, JEN Mentors are available to provide mentorship towards fostering a productive, well-rounded career as a professional musician or music industry professional. The JEN Mentor roster includes experienced professionals in a broad range of music industry pursuits, both on and off the bandstand. JEN Mentors are available to act as a sounding board on a range of professional development advice and information relative to student’s chosen area(s) of music business pursuit. JEN Mentors are also available to aspiring high school jazz students through a special component of the program provided through HS students’ band or program director. JEN Mentors include a roster of master level musicians and educators, as well as industry experts from around the country. Interested aspiring jazz musicians as well as aspiring music industry professionals in a variety of pursuits, including music education, studio tech, concert/festivals/conference presenting & production, music publishing, etc. can learn more and sign up for a JEN Mentor through an open-ended application process at www.jazzednet.org; just go to the Advancing Education section of the Jazz Education Network site and you’ll find the JEN Mentor Program guidelines; those interested in being JEN Mentors may sign up there as well. At the January 2-5, 2013 JEN Conference in Atlanta, the brilliant drummer-bandleader-educator Matt Wilson gave a very illuminating and rewarding talk on the subject of “Audience Decline: Is it Because Jazz Concerts Are Boring?” that dealt with musicians’ responsibilities to the audience for jazz that was sprinkled with excellent advice and good humor. 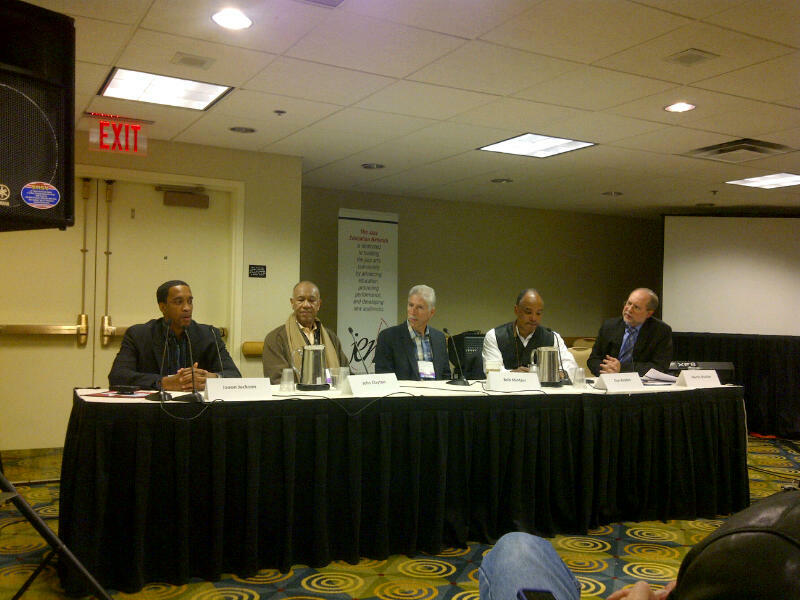 On January 10 I moderated a panel session on Mentoring at the Jazz Connect Conference at the New York Hilton that also touched on aspects of the musicians’ responsibility to his/her audience, as well as other critical elements of experienced artists mentoring students and developing jazz musicians. Panelists for that session included Wilson, fellow drummers Carl Allen and Michael Carvin, saxophonist Greg Osby, and New School director Martin Mueller. I asked Matt Wilson to further illuminate his discussion from the JEN conference. Matt Wilson’s sense of humor is never far from the surface, but the drummer is always full of wisdom as well. What motivated you to present that particular session on the presentation responsibilities of artists at the JEN conference? I am puzzled by the lack of imagination that is present when presenting jazz music. Often, collegiate concerts sound like final examinations. I want to hear sounds that surprise! We give them tools to play but take away their ” spirit ” of adventure. Look at guitar players in jazz bands and you see what I mean, They sit and they look scared. At home, they are probably spitting fire and stage diving. Jazz is not a safe music Willard, never has been, never should be. Why does that aspect of artists striving to connect with their audiences seem like such a dying art? Because we have made ourselves too damn important. Jazz is one of America’s folk musics not classical music. Though to my eyes and ears, engaging classical music embraces the listener, welcomes them in to be a part of the sonic fabric. You feel Andre Watts or Anne Sophie Mutter right? Entertaining can be a bad word I understand. But it also means to be gracious and that is how I perceive it. You are displaying gratitude that folks are there to share some human moments with you. Human moments, that is what we need in 2013! How important is this component, this aspect of stage presence and presentation to a student’s music education? …And don’t forget, you can learn more about the Jazz Education Network (JEN) Mentor Program at www.jazzednet.org and go to the Advancing Education section of the site. aspiring jazz musicians should see how houston person and lou donaldson perform and connect with the audience who always love their performance. I read Matt Wilson’s talk at the JEN conference in Atlanta and I think it was and will remain really illuminating. Relationships build trust”,”Trust creates community”, “Community creates legacy”. ON AND OFF THE STAND. How true! I just experienced all this personally at a concert given a week ago at the ‘Blue Note’ in Milano, Italy by the Bill Charlap trio (with Peter Washington and Ridley Green). I talked with Bill off the stand and immediately we established a relationship that’ll stay with me for ever. Bill was great both on the stand and chatting with me with the warm and genuine modesty of a great poet of the jazz piano.